Rosettes have been all a flutter in social media for the past year. It's a great trend; I love them. 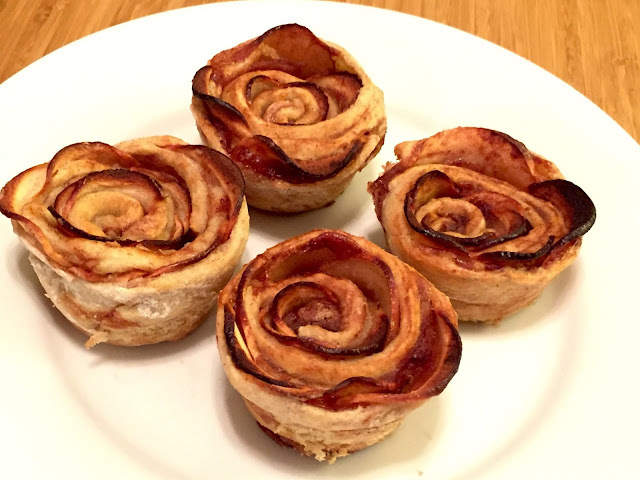 I decided to give these apple roses a try. Super easy. Here's an example video. Instead of using apricot preserves, I went with cinnamon sugar. Unfortunately for those of us who can't do gluten, puff pastry is not an option. As there's no gluten-free puff pastry on the market. I hope to change that one day! If you can find a roll-out, ready to bake gluten-free dough - use it! Otherwise, here's a simple recipe to whip up. Prep the apples: In a large microwave-safe bowl, mix the lemon juice with the water. Cut the apples in half and core out the seeds. Slice very thin. Leaving out the top and bottom slices. Mix apple slices in lemon water and microwave for 3 minutes. Drain in colander. Allow to cool before handling. Make the dough. Mix together the flours with the salt and then mix in the melted butter and scrambled eggs. Mix until it comes together. Roll out on any GF flour dusted surface to about a quarter inch thickness. Assembly. Cut dough into strips of 8 inches long by 1.5 inches wide. Sprinkle cinnamon sugar on the dough. Lay down apple slice beginning at the left, then overlapping next slice over half of the previous slice. Repeat, giving a little space at the end. Fold dough over the apples. Sprinkle more cinnamon sugar on the dough and apples before rolling up. Roll up loosely. Remember, this is organic not perfection. Place in greased and cinnamon sugared muffin tin. Bake for about 40-45 minutes, until golden brown.